When it comes to addressing the Oklahoma education funding crisis, the Jenks Public Schools Foundation has turned grassroots solutions into an artform. Nowhere is this more apparent than with the foundation’s fundraising initiative, Trojan 20, which recently garnered a 2017 Outstanding Program Award for Local Education Foundations from the Oklahoma Foundation for Excellence. 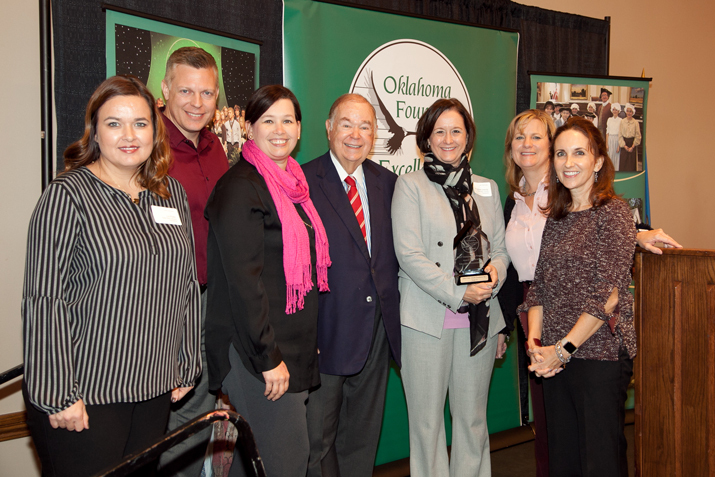 The Jenks Public Schools Foundation was one of four organizations that received a $1,000 monetary award and commemorative plaque, which were presented at the Fall Forum for Local Education Foundations held October 17th in Norman. The Outstanding Program Awards recognize innovative programs (sponsored or administered by Oklahoma public school foundations) that showcase the positive impact creative, grassroots solutions have in helping academic excellence flourish in the community. The Jenks Public Schools Foundation partnered with the District to launch Trojan 20 in the spring of 2016. The fundraising campaign was designed around a simple premise: encourage members of the Jenks community to donate $20 for each Trojan student. By cultivating small donations on a large scale, the foundation’s goal was to generate much-needed funding for instructional budgets—specifically school site budgets, instructional supplies and equipment, and professional development for instructional staff. After launching a massive promotional campaign driven by digital media and word-of-mouth efforts, the foundation received more than 1,600 donations from across the community—raising $214,898 for Jenks Public Schools, which included a generous gift from the Tulsa Teachers Credit Union Support Our Schools (SOS) campaign. The success of the Trojan 20 program not only helped to bridge the state funding gap, but also served as a powerful testament to the investment of the Jenks community in its students and teachers in times of need. The Outstanding Program Award will always stand as a visual reminder of that investment.